I’ll admit it: I buy books—novels, cook books, non-fiction—based on size. And while bigger may not always be better (e.g., anything by Jonathan Franzen), it mostly is. What can I say? I am a more kind of gal. So when Joël Robuchon issued his nearly 800-page bible of modern French cooking, I could not resist it. Not because I have stopped worshiping at the altar of Julia (that will NEVER happen), but because Robuchon pulled together a pure cook’s cook book: no photos, no inane stories, no flights of fancy with missing instructions, no ridiculously complicated recipes full of ingredients that one can never find without mad wholesale connections. No, this book is a treasury of hundreds of meticulous recipes, from the exquisitely simple (e.g., variations on poached eggs, including one in red wine!) to divine variations on familiar dishes made all the more magical through the addition of lardons. You can find complicated French here. Or, as on Pages 326–7, you can find a delicious, relatively quick entrée that can be easily pulled together for a sophisticated after-work dinner. 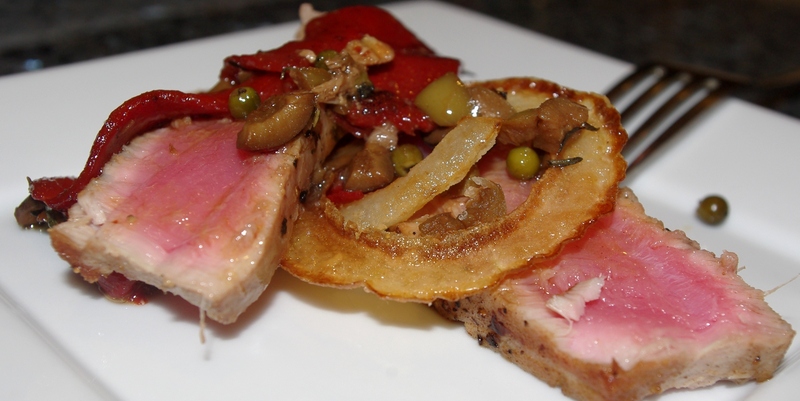 I had to run to the store to buy fresh tuna, but the rest of the ingredients for this French mélange (with an Asian twist ) were in my house: onions, soy sauce, capers, olives, sun-dried tomatoes, garlic, wine vinegar, piquillo peppers, green pepper. The steps appear complicated but are far less arduous than what appears on paper. The onions are sliced into rings, dredged in four then fried then finished with sea salt. Most of the other ingredients go into a piquant, umami sauce, then the tuna steak is quick fried in the same oil used for the onions. Start to finish, this took about less than 60 minutes. Once completed, I had something that tasted like I spent hours cooking in the Mediterranean. I have not cooked my way through this tome, but I am yet to be disappointed. Buy it. Try it. Bon appétit. How was the sauce put together? It’s a reduction of red wine vinegar, olive oil and soy sauce with a clove of garlic, to which (at the end) you toss in the capers, peppers, olives (black and green) and warm through.